• I am not certain if I understand why inner-city residents would complain to bylaw officers about the noise coming from the preacher’s am¬plifier. It seems to me that getting the homeless people off the streets would be the best way to qui¬eter, more enjoyable inner-city neighbourhoods. Approximately 100 people regularly attend the sermons. 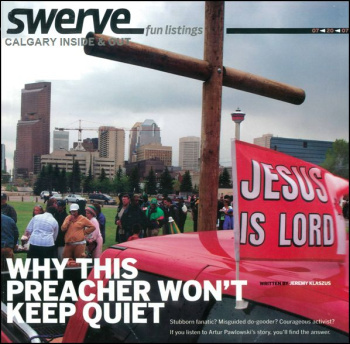 • Re: "Tempers flare as preacher defies bylaw officers," April 16. I reside directly across from Triangle Park, where Art Pawlowski serves up his ser¬mons several times a week. The noise from his loudspeakers is often loud enough to wake me out of a dead sleep. I’ve had guests leave my home due to the noise and I have been unable to enjoy watching a movie on a Sunday afternoon because his ranting and raving drowns out my tele¬vision (with the windows closed). One recent night, at 10:30, I could hear him screaming hoarsely as I tried to go to sleep. I’m a huge advocate of free speech and I passionately sup¬port his right to express his opinions. I take issue with the sheer volume of his sermons. I’m not alone in this and many people from our community have ex-pressed these concerns to the city. It’s not unreasonable to ask that the volume be decreased to a tolerable level. We have just as much right to our sleep as he does to his be-liefs.